For social media managers, reaching young audiences with irreverent memes and tweets is a dangerous endeavor. 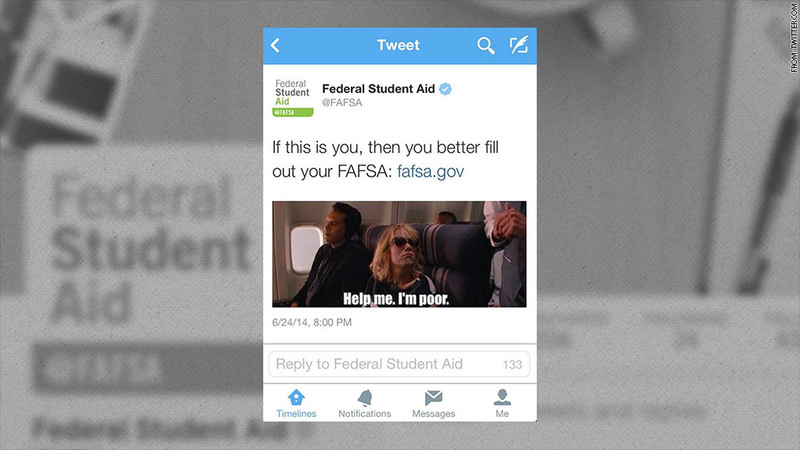 The latest entity to end up with egg on its face is the Federal Student Aid office, which on Tuesday tweeted an image that many readers felt mocked the poor. The image, a common meme derived from the 2011 comedy "Bridesmaids," features Kristen Wiig's character pouting about being sent back to her coach seat after sneaking her way into first class, with the caption "Help me. I'm poor." It encouraged readers to fill out a Free Application for Federal Student Aid, or FAFSA, which gives students and would-be students access to the office's financial aid programs. 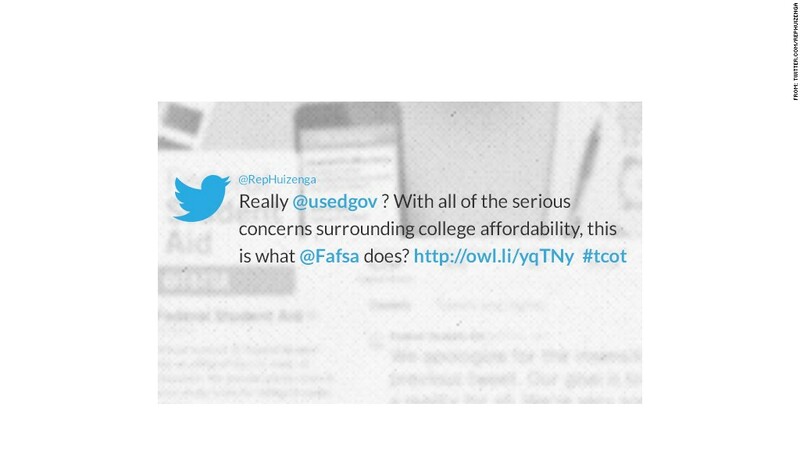 FAFSA is also required by many colleges, universities and private financial aid providers. Within minutes, almost universal condemnation of the tweet started spreading across the social networking site, calling it "offensive" and "tasteless" and mocking its attempts at outreach. The Federal Student Aid office, which is part of the U.S. Department of Education, controls more than $150 billion in grants, loans and work-study money that is distributed to more than 15 million students each year. It apologized for the tweet around 1 am on Wednesday morning. In a statement, a spokeswoman for the Department of Education called the post "insensitive" and said it "flies in the face of our mission of opening doors of opportunity for every student." 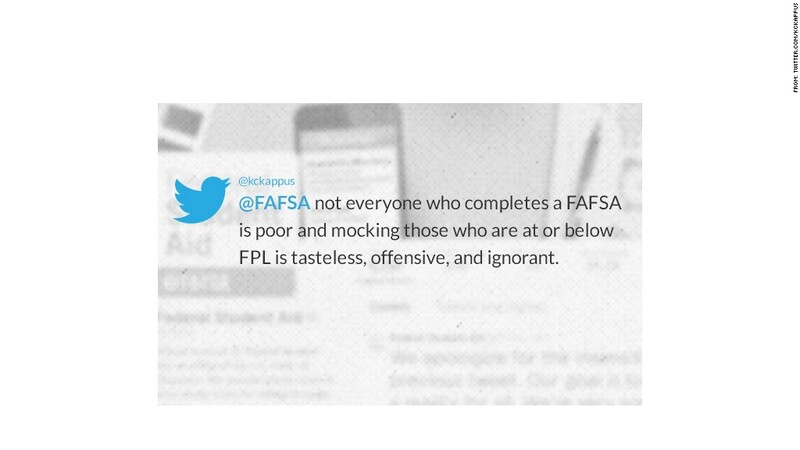 "It was an ill-conceived attempt at reaching students through social media," the spokeswoman, Dorie Nolt, said. "We are reviewing our process for approving social media content to ensure it reflects the high standards we expect at the U.S. Department of Education." 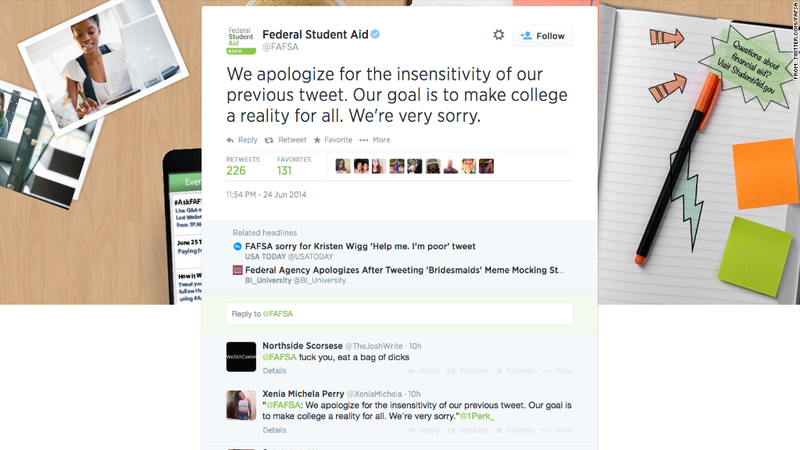 The Federal Student Aid office is by no means alone in having goofed on social media recently. On June 17, Delta Air Lines (DAL) posted images of the Statue of Liberty and a giraffe to celebrate the U.S. win over Ghana in the World Cup. Followers quickly pointed out that Ghana has no giraffes. Back in March, a campaign launched on Twitter to cancel "The Colbert Report" after the show's verified account tweeted out a message that many felt was racist against Asians. The show's host, Stephen Colbert, denied involvement with the tweet. The show survived the campaign, and despite the gaffe, Colbert was named as David Letterman's replacement a few weeks later.